Join our discussion on creating a dual-language magnet school for the Hartford region. Dual-language schools (also known as two-way immersion) enroll balanced numbers of English-speakers and native speakers of the partner language (such as Spanish), and design a curriculum for all students to learn both languages. Dual-language schools have successfully brought together English- and Spanish-speaking students for a quality education in other parts of the United States. How can we draw upon this model to create an interdistrict magnet school for city and suburban students in the Hartford region? “A Peek into the Life of Barbieri Elementary: A Two-Way Bilingual School / Una Escuela de Doble Via,” Framingham, MA, by Brad Puffer, 2013, http://www.youtube.com/watch?v=pNGBNdnfNh0. Eaton, Susan. Have We Learned Our Language Lesson? In Spite of Massachusetts’ Decade-Old English-Only Law, Two-Way Bilingual Programs Demonstrate Promise and Enjoy Enduring Popularity. Stories from the Field. One Nation Indivisible, June 2012. http://www.onenationindivisible.org/. Massachusetts Association for Bilingual Education. “Definition of Dual Language Programs” and “What is Dual Language Education?” 2012. “The Quest for Dual Language Literacy: Huge Challenge May Also Be Hartford’s Greatest Opportunity.” Achieve Hartford Education Matters (February 7, 2013). http://www.achievehartford.org/upload/files/2-7-13–EDUCATIONMattersEXTRA(2).pdf. Hartford Public Schools. Two-Way Language Program Feasibility Study, January 3, 2013. http://www.achievehartford.org/upload/files/DualLanguageDiscussion—20130124123318926.pdf. Dyrness, Andrea. “Opinion: We Should Promote Bilingualism in Schools.” Hartford Courant, March 23, 2012. http://www.courant.com/news/opinion/editorials/hc-op-bilingualism-makes-us-smarter-20120323,0,550496.story. 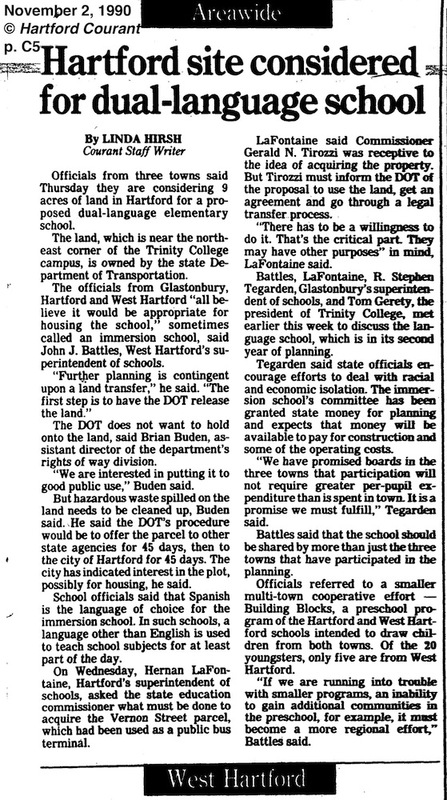 Did you know that in 1990, leaders from Trinity College, Hartford, West Hartford, and Glastonbury considered building a dual-language magnet school in the space that eventually became the Learning Corridor? Read more in this Hartford Courant article. “Puentes Dual-Language Immersion Program, Regional Multicultural Magnet School, New London, CT” video by Nyesha McCauley, Achieve Hartford, 2013, http://player.vimeo.com/video/63933986. Howard, E.R., et al. Guiding Principles for Dual Language Education, 2nd edition. Washington DC: Center for Applied Linguistics, 2007. List of 422 programs in Directory of Two-Way Bilingual Immersion Programs in the US, Center for Applied Linguistics, 2012. Utah Department of Education, “Utah Dual Immersion,” video, 2011, http://www.youtube.com/watch?v=hTG0YFU8vWA. Dual Language Education of New Mexico, “Voces Bilingües, Voices of the Future” video, 2011, http://player.vimeo.com/video/33035607. P. Zitlali Morales and Ursula S. Aldana, (2010) “Learning in Two Languages: Programs with Political Promise,” in Forbidden Language: English Learners and Restrictive Language Policies, Edited by Patricia Gándara and Megan Hopkins, New York: Teachers College Press. April Linton and Rebecca C. Franklin (2010), “Bilingualism for the Children: Dual-Language Programs Under Restrictive Language Policies,” in Forbidden Language: English Learners and Restrictive Language Policies, Edited by Patricia Gándara and Megan Hopkins, New York: Teachers College Press. Ofelia Garcia and Jo Anne Kleifgen (2010), Educating Emergent Bilinguals, New York: Teachers College Press. Norma González (2005), “Children in the Eye of the Storm: Language Socialization and Language Ideologies in a Dual-Language School,” in Building on Strengths: Language and Literacy in Latino Families and Communities, Edited by Ana Celia Zentella. Genesee, F. & Lindholm-Leary, K. (2013). Two case studies of content-based language education. Journal of Immersion and Content Based Language Education. John Benjamins. Howard, E., Sugarman, J., and Christian, D. (2003). Trends in two-way immersion education: A review of the research. (Technical Report 63). Baltimore, MD: Center for Research on the Education of Students Placed at Risk (CRESPAR). Howard, E. & Sugarman, J. (2007). Realizing the Vision of Two-Way Immersion: Fostering Effective Programs and Classrooms. Washington, DC: Center for Applied Linguistics. Thomas, W. P. & Collier, V. P. (2012). Dual Language Education for a Transformed World. Albuquerque: Dual Language Education of New Mexico and Fuente Press.